Bronx, NY, May 7, 2015 – Alex Rodriguez continues to defy the odds presented before him. He is 40 years old, a year away from the game, and two hip flexor surgeries in the last 3 years, so how would 2015 be? It seems like Alex has found the fountain of youth after a year off. His bat speed seems to be back, and he is as focused at the plate as he has ever been. After hitting his 660th HR to tie Willie Mays last week, the baseball world was waiting in both angst and excitement to see him hit his 661st HR to move him in fourth place all by himself. In the first inning, Rodriguez came up with runners on 1st and 3rd and looked to get the 661st HR off his back early, and he almost did. After hitting an opposite field bomb to right that traveled 331 feet, Delmon Young (A-ROBBED) Rodriguez to prevent him from history. Even though that could have been devastating, Rodriguez was not to be denied on this night. He stepped into the batter’s box in the 3rd inning with two outs and no one base with the scored tied 2-2, facing Chris Tillman. Rodriguez took the first pitch for a strike. After stepping out and adjusting himself, he once again stepped into the batter’s box; only this time, he took ball one. On the very next pitch, Rodriguez crushed it to deep left center where no one was going to catch “A-ROB” him, catapulting him to 4th place on the homerun list all by himself. 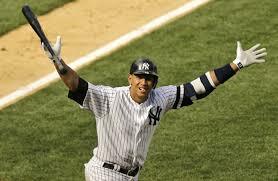 Rodriguez went from villain to hero as the Yankee crowd roared and cheered as he circled the bases. But the fans did not stop there, calling for a curtain call which Rodriguez had no problem giving. Once one of the brightest stars in the game, A-Rod’s road to redemption has been a long journey and seeing what he has been able to produce has been a bright spot thus far. His dim star has started to shine brightly once again, and just when you though his career was over and done with, he has proven that he has a lot to accomplish and is far from done. Rodriguez’s humbleness this year has shown that the suspension he served not only was a punishment but a reminder of how lucky and blessed he is to be playing in the MLB which has helped him return back to prominence. This is his summer even though the Yankees may have mixed emotions regarding his success. For Rodriguez, there are more accolades and records to be attained. He is 40 hits shy of 3,000, 13 RBI shy of 2,000 and is chasing Yankee legend Babe Ruth who is next on the list with 714 home runs. Rodriguez is a living testament of forgiveness because the Yankee fans seem to have forgotten about his mistakes in exchange for not only history, but wins because that’s the Yankee way.